In addition to the two new mini-laptops MSI recently unveiled, the company is showing off several new nettop, low profile desktop computers. We’ve seen some of the MSI nettops before, including the iMac lookalike MSI introduced a few weeks ago. But there are also a few new computers in the works, including the MSI WInd Box, which is a tiny, thin computer that actually looks a lot like a laptop with its lid, battery and keyboard ripped off. And that’s kind of what it is. If you look at the side of the computer, you’ll notice that the USB ports, VGA output, and SD card reader are all in pretty much the same position as they would be on an MSI Wind U100 netbook. The nettop’s low profile form factor makes it ideal for mounting on the back of a monitor, or shoving below your desk. 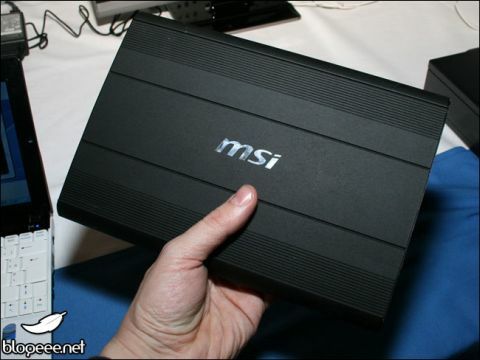 The MSI Wind Box sports a 1.6GHz Intel Atom CPU, 1GB of RAM, a 160GB hard drive, 802.11b/G WiFi and runs Windows XP. Other models will be available with more RAM and larger hard drives. The base model will sell for 200 Euros or about $258. You would think removing some of the expensive bits (display and battery) would drop the price a bit more. This would make a decent car computer. by the time it makes it to the US. As a fan of silent computers (I don’t just mean quiet), I noticed the MSI Windbox is fanless. With an SSD, you wouldn’t even hear the drive clicking. Fanless is a feature I have yet to see in any other Atom-based small computer. The Eeebox is quiet but still fanned. If Intel ever comes out with a more efficient chipset for the Atom you will see most of the netbooks go fanless. Unfortunately, with little or no competition from AMD or VIA, Intel has no real incentive to spend more money on R&D.